As promised, here is the first review of February. I have more planned for the month, but I believe there will be less than January which had nine. Regardless, our first taste of judgment comes from the last entry on the GameCube of this popular franchise. It's Mario Party 7. 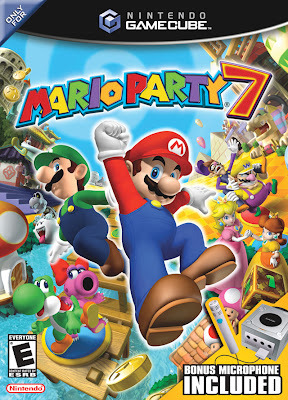 Mario Party's Lucky Number Seven? The GameCube was kind to the Mario Party series back in the day. Hudson Soft was pumping them out faster than people could buy them. Then came the criticisms that the games were rehashes even though each installment introduced new gameplay concepts. This tradition continues with the final Mario Party released for the GameCube, Mario Party 7. Is this a pleasure cruise, or will you get seasick from the action? After a seemingly infinite amount of times saving the day, the princess, and various Nintendo systems from failure, Mario needs a break. Even his vacation in Super Mario Sunshine was marred by cleaning up after Shadow Mario. That's no vacation-- that's work! Toadsworth greets the portly plumber and asks him if he will grace him with his presence on a nice relaxing cruise along the ocean. Mario agrees and the entire Mushroom Kingdom cast joins in on the fun. However, Bowser was not invited, and he seeks vengeance for this oversight. His plan is to completely ruin Mario and company's ocean tour through any means necessary. Juggling is fine and all, but can you breakdance? How does he accomplish this? Every five turns in a regular Party Cruise game (the Classic mode of Mario Party) is Bowser Time, an occurrence where the king of the koopas interferes and causes trouble for players. Sometimes he opens a shop where a player is forced to purchase a worthless item for an exorbitant amount of coins, other times he might just blatantly steal a star from first place. While this new gameplay mechanic might sound interesting, it quickly grows tiresome and makes an already unpredictable game even more so... sometimes just cheap as all get out. 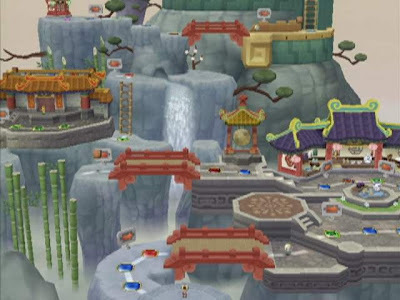 For instance, in Grand Canal, the first board of the game, Bowser can place a bunch of his spaces on the bridges that intersect the various islands of the game. When a player lands on his space, either a single-player or multiplayer mini-game takes place. These have players avoiding the shots of fire from Koopa Kids, leaping from platform to platform, trying not to fall into the lava, and trekking boldly through a deadly obstacle course while being chased by a fire-breathing machine. For every player that loses the game, Bowser will steal half or all of their coins or even a star. The problem with these games is that they go on way too long to complete them. Race to the top of Pagoda Peak to purchase a star. Another error comes with the microphone-compatible mini-games. Instead of just being limited to 1vs3 games, they have been expanded to all types. There's even a space players can land on where they can bet coins, memorize cards, and speak out which card was located where. After playing this game, saying the obvious correct answer only to be told I was wrong, I promptly turned all mic mini-games off. Your mileage may vary. 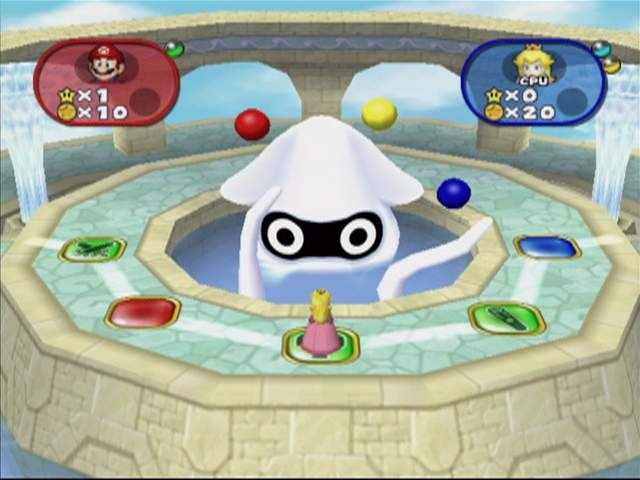 There are several types of mini-games: a 4-player, 1vs3, 2vs2, Battle, and Duel mini-games. I don't like how Duel games work either as the person who lands on the space no longer gets to make the bet. Instead the winner stops a slot machine and either takes all of the loser's coins, half of the loser's coins, 1 or 2 stars, or get unlucky and win nothing from their opponent. dangerous way of staying in shape. 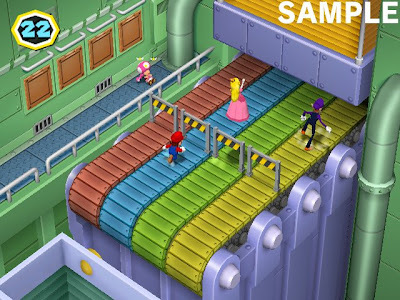 The actual mini-games played are the shining grace of Mario Party 7. There's games where you try to punch your opponents out of a floating bubble arena, games where you leap over hurdles (some of which are electrified) while running along a treadmill, games where you snowboard through alternating gates, games where you team up to take down web-shooting spiders in an attempt to rescue Flutter (an enemy from the Mario universe), and games where you ground-pound tiles with the goal of making them your team's color. The games are for the most part enjoyable, and thankfully only one or two can be considered luck-based, the types of mini-games that are true pet peeves of mine. different point values, aiming for the top score. The single-player mode this go around is called Solo Cruise. You choose a board, go up against one computer or one friend, and try to complete the board's objective before the other player. For instance, on Pagoda Peak the goal is to gather 100 coins and reach the top first while on Pyramid Park the object of the game is to retrieve a stolen star and give it to the Bowser sphinx which sits near the center of the board. Solo mode is an entertaining diversion and it is the only way to unlock the final board which belongs to Bowser. Likewise, the meat and potatoes of Mario Party games is the multiplayer action, and Mario Party 7 does not disappoint here. You can play free for all, 2 on 2 (a pair of players roll dice blocks numbered from 1-5 and their rolls add up to how much they move), or with four controllers, four teams of two. Of the six boards of the game, each one has different means to win the game unlike past titles in the series. Grand Canal is your standard Mario Party rules of buying a star for twenty coins which then moves to a new location after it has been purchased. Meanwhile, Neon Heights houses three treasure chests. Only one contains the star while the other two either contain coins or a Bob-omb that will explode, sending the unfortunate player back to the start of the board. Each time a star is found, three new chests materialize on the board at new locations. Share a controller to play these eight-player mini-games. 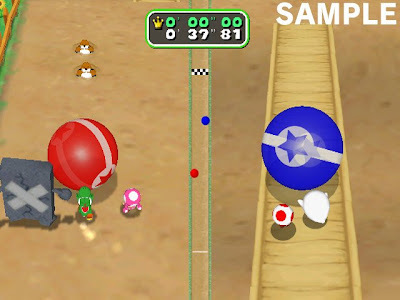 Returning from Mario Party 5 and Mario Party 6 is the concept of orbs. You can either pick these up from spaces on the board or buy them from shops. There's over twenty different types. Some transport you to the location of the star, some allow you to roll two or three dice blocks, some allow you to throw them onto spaces where if a player lands on it, a myriad of different effects can happen such as stealing coins, stealing orbs, or even stealing a star. Proper and strategic use of orbs is key in deciding between victory and defeat. At the conclusion of each game (and if they have been selected to be awarded or not), bonus stars are presented to players. Unfortunately, Mario Party 7 was the start of random awards. What I mean by this is that in the past Mario Party games, you knew which bonus stars were going to be awarded, so you knew what to gun for. Not so with Mario Party 7. Three bonus stars are handed out either by winning the most coins in mini-games, landing on the most red spaces, landing on the most action spaces, using the most coins at shops, moving around the board the most, or using the most orbs in a single game. This makes Mario Party 7 even more based on chance than past entries in the franchise. After each Solo or Party Cruise round, every player (including the CPU) has their amount of spaces moved tabulated. These turn into mileage points which can be used at the game's shop to purchase a plethora of items such as new mini-games, new characters like Birdo and Dry Bones, taunts, souvenirs, higher difficulties for the computer, and much more. 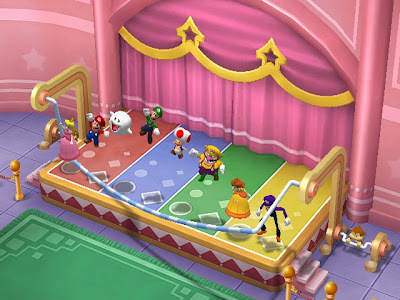 There isn't a shortage of activities to be found on Mario Party 7's cruise ship, and thankfully, shuffleboard ain't one of them. Mario Party 7 is a decent looking game based on the era it came out. It could pass as a low-level Wii game even, but that isn't saying much about either the GameCube or Wii hardware. There are plenty of jaggies to be found on characters, and the various texture work in the game is passable at best. 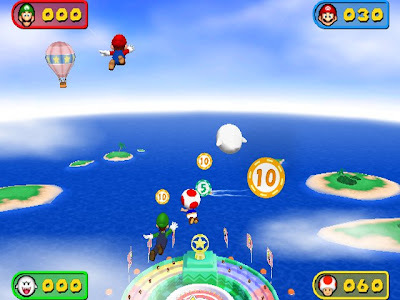 Most games run without any signs of slowdown, and the framerate of Mario Party 7 is steady, too. The compositions of the game are mostly forgettable besides some short victory fanfare themes. Other tunes like Grand Canal and Pagoda Peak are just grating on the ears and nothing else. In Sphere Factor, see if sphere is not a factor for you. Overall, Mario Party 7 might be one of the lesser installments of the franchise. The amount of chance that is involved is at an all-time high. Nothing is for certain in Mario's seventh fiesta. You can play the best, win every mini-game, and you could still be messed over by bad dice rolls and unlucky events. Bowser Time is cute at first, but it slows the game down to a crawl, especially Grand Canal's "let's put Bowser spaces all over the board with games that last a minute or more." There is probably a reason why the option was made to allow players to have the minimum amount of turns be ten instead of the series standard twenty. Mic mini-games may be a dud, but the non-mic games are mostly a blast to play. While not a full-fledged pleasure cruise, there is some fun in the sun to be had with Mario Party 7. Mario Party 7 did have some cool mini-games, and I think the idea of Bowser being all mad about not getting invited is funny. This was about the point where this series completely lost it for me. I think the main reason was the boards themselves have become less interesting in recent installments. I think Mario Party 2 is the best one. Good review!